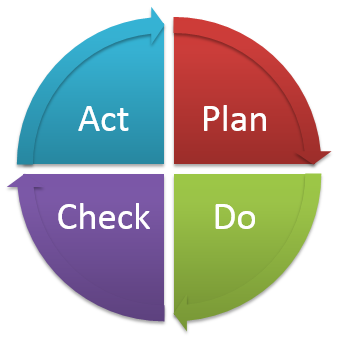 The Deming Cycle, also known as the PDCA (Plan-do-check-act) circle is one of the oldest models in the manufacturing world. It was a model that encourages continuous improvement and was first introduced to the world by W. Edwards Deming way back in the 1950s. He stated that every organization needs to have a continuous feedback loop in place so that management can pinpoint and deal with areas that need to be improved on. To explain his point further, he introduced the PDCA (Plan-do-check-act) circle which is a very systematic approach which can easily be followed by anyone to deal with problems. There are three steps involved at this stage and the first one is investigating and knowing the current situation a business is in, understand the problems and highlight areas that need to be improved. The easiest way to do all of this is to use things like value stream mapping as well as flowcharts. These two will make life very easy for managers to know what is happening. Step number two is to analyze the problem at hand in the organization. This is where management, as well as the employees, can gather as well as interpret information. The main tools which they can use to make things easy include things like spider charts, column chart, control charts, and a scatter plot. To better understand the root of the problem, an organization can use cause-effect methods and even brainstorming. Step number three is to develop solutions to the problems at hand. There is no point letting problems drag on without dealing with them because they can slow down the operations of an organization. The sooner problems are dealt with, the better. This is where the team at an organization go ahead and implement any improvements that were drafted in the planning process. While implementing things, the management and employees can put any problems encountered as well as any knowledge and lessons learned in writing. Changes will have to be tested first before any medication to the organizational policies or systems are made. When management and employees at a particular organization see that their project is finished, they can make a list of solutions and problems as pointed above and study them carefully. This involved carefully analyzing to get a clear picture of the outcomes to make sure this does not happen again. Information collected is compared properly especially new with the old to understand whether there have been improvements or not. The best way to check if improvements are being made in an organization is to use things such as radar charts, control charts, runs charts, column charts, and control charts. If no one the organization has experience interpreting data collected, an external auditor can be hired to make sense of things. It is better to do things this way (hire external help) than trying to interpret something that no one in the ranks understands. This is risky because false conclusions can bring in their fair share of problems like implementing the wrong method to deal with a certain issue. This can lead to a waste of time, resources and money which is the last things a business wants especially if improving is their goal. It is better to be safe and get help when needed than to be sorry and this is the approach many successful organizations take if they want to make sense of charts in front of them. When all the steps above have been successfully followed, it is time for an organization to take action to improve. Options at their disposal include things like adapting, abandoning and adopting. If the proposed improvement does not yield the desired results, an organization can always go back to step one and come up with other news ways or areas to improve. Overall PDCA (Plan-do-check-act) is all about establishing methods or processes that a business needs to get the best results with the resources at their disposal. Solutions need to be drawn up, checked and acted upon. Results need to be closely monitored as well as if they do not work, its back to the drawing board and come up with new ones. The post What is PDCA in Six Sigma? appeared first on Shmula. What is the Is/Is Not Analysis in Six Sigma? Is Lean Six Sigma Truly Universal Enough to Work for Any Process?